You know how it is. You do something often enough that it becomes commonplace. You pass by things without truly noticing. You see without seeing. And then, one day, you see something that was there all along. And your discovery of it comes as a delightful surprise. So it was with The Sentinels. 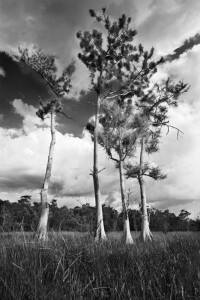 During my drives across the Everglades on the Tamiami Trail I have passed by this group of cypress trees innumerable times. Then there was that day, that particular day, when the late afternoon light was so beautiful that my attention was called from the road to one nicely lit spot in the landscape after another. 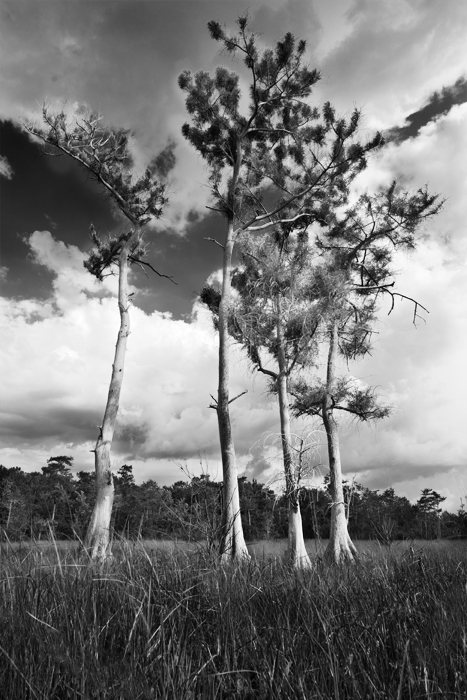 And there they were, four impressive cypress trees standing in an opening. Due to the golden, low-angle lighting accentuating them, they looked as if they were on some sort of dramatic stage set. I did not have time to stop. But I made a mental note of the trees and their location, vowing to return. Approximately two months later I did just that. I timed my arrival for late afternoon. Lighting was nice. Shadows cast by the slowly setting sun emphasized the fluted shapes of the tree trunks. Dark areas are necessary to create the illusion of three dimensions on the two-dimensional medium of a photographic print. Shadows contrast with light and provide a sense of volume. I liked the way that the shapes of the tree’s uppermost branches to some degree paralleled angles in the clouds above and behind them. I call them “The Sentinels” because they seem like guardians of some sort. They stand tall, silent, and with a presence.